Building high-quality expanded learning programs. The California AfterSchool Network (CAN) mission is to provide expanded learning practitioners, advocates, and community members with the resources and tools necessary to build high quality expanded learning programs in California. CAN advances effective policies and is a catalyst for expanded learning program quality. Utilizing its unique and effective leadership and committee structure, CAN is a convener of the field, able to facilitate a two-way flow of information between the field and State and National policymakers where the needs and thoughts of the expanded learning field at all levels can influence and inform policy and policy is translated into practice. Ultimately CAN believes that these efforts will bring greater coherence and professionalism to the field. With stakes high and time precious, CAN promotes the belief that expanded learning programs can be a robust place of learning and discovery that supports high achievement for all students. To that end, CAN leverages existing high-quality resources to the field and creates high-quality resources for the field when gaps are discovered. As a catalyst for quality, CAN disseminates promising and emerging practices around aspects of program design, implementation, and assessment. Connecting multiple levels of program practitioners with the resources, strategies, and individuals they need to ensure the most relevant and effective program possible, CAN is committed to fostering and supporting the next generation of leaders in the expanded learning field. California boasts the largest expanded learning infrastructure in the nation. In March 2015, the Afterchool Alliance released America After 3pm, summarizing a national survey assessing participation, access, public support, and family satisfaction with after school programs. Based on their findings California is ranked number one in the nation for after school! The report surfaced strong public support for after school programs, which demonstrate a strong return on investment. The California AfterSchool Network is housed at the Foundation for California Community Colleges and is closely aligned with the Foundation's strategic goal to expand student access, success, educational, and career outcomes through the promotion of student-centered resources and tools. The Foundation's fiscal sponsorship connects CAN to California's expansive learning infrastructure, the California Community Colleges, and the Foundation's student success efforts and workforce initiatives. This partnership will result in expanded learning program quality, pathways for students into higher education and career preparation programs, and pathways for community college students into teaching and other youth-serving careers. 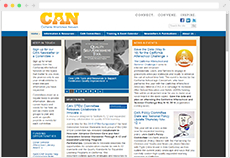 Sign up for the California AfterSchool Network Newsletter to receive updates about important CAN news.